We presented a grammatical view of logic programming where logic programs are considered grammars. 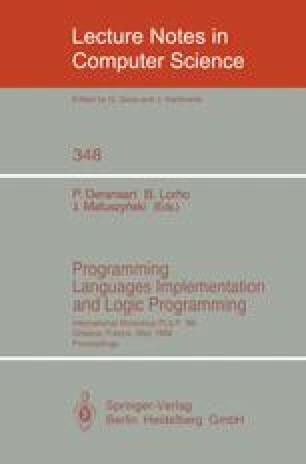 This gives a natural framework for defining extensions to the concept of logic program. The paper shows that many useful extensions of Horn clauses incorporated in Prolog without theoretical justification correspond to well-established grammatical concepts. In particular the notion of DCG is a special case of W-grammar, modes are related to dependency relation of AG's, domain declarations of Turbo Prolog can be seen as a metagrammar of W-grammar and Prolog arithmetics fits naturally in the framework of RAG's with non-term interpretations. The grammatical point of view shows also a possibility of further extensions, not incorporated in Prolog, like a natural use of external procedures in logic programs. It also opens for the use of “grammatical techniques” like parsing or attribute evaluation in implementation of logic programs. On the other hand, the comparison of the formalisms shows that resolution techniques can be used for some grammars which were considered practically intractable, like RAG's or W-grammars. Last but not least, the grammatical point of view makes it possible to apply in logic programming some proof techniques developed originally for proving correctness of attribute grammars.